Each year the River Torne in Northern Sweden freezes and so begins the yearly cycle of building and ice harvesting for the construction of the world famous and original ICEHOTEL in Jukkasjärvi. 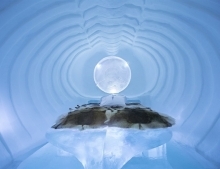 Guests travel from all corners of the globe to experience a night in one of the ICEHOTEL’s intricately crafted ice rooms which remain at a constant temperature below freezing. 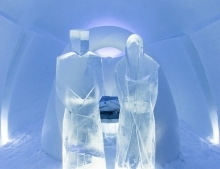 The sculptures in ice, the array of winter activities and the possibility to view the Northern Lights create an enchanting short break, holiday or honeymoon available between December and April. The itinerary will be customized to your requirements and preferred travel dates. 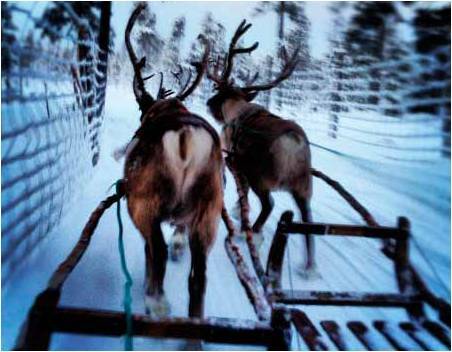 Arrive in Kiruna and transfer to the IceHotel. 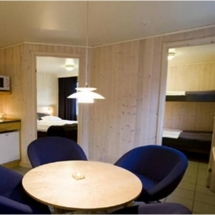 You will stay in warm accommodation for two nights followed by one night in cold accommodation. 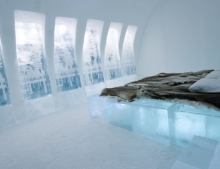 The holiday is completely flexible which means that you can arrive when you wish and add extra nights or keep your warm accommodation during your stay in the ice room (supplementary cost). 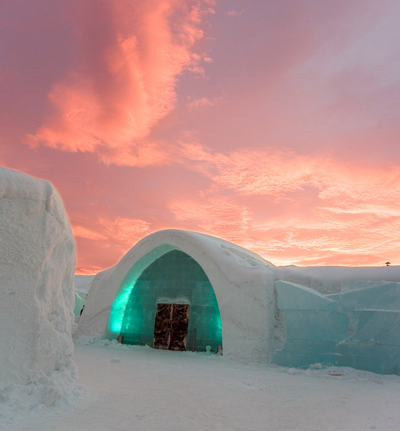 As experts in holidays, honeymoons and short breaks at the ICEHOTEL in Sweden, the team will be happy to advise you. 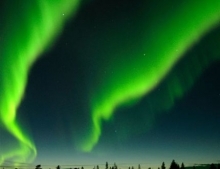 As night falls, try and catch your first glimpses of the Northern Lights in the dark skies or join one of our guided excursions. 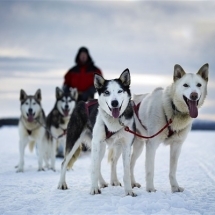 The world’s first and largest hotel built of snow and ice and is situated in Jukkasjärvi, a small village in Northern Sweden with 1,100 residents and 1,000 dogs. 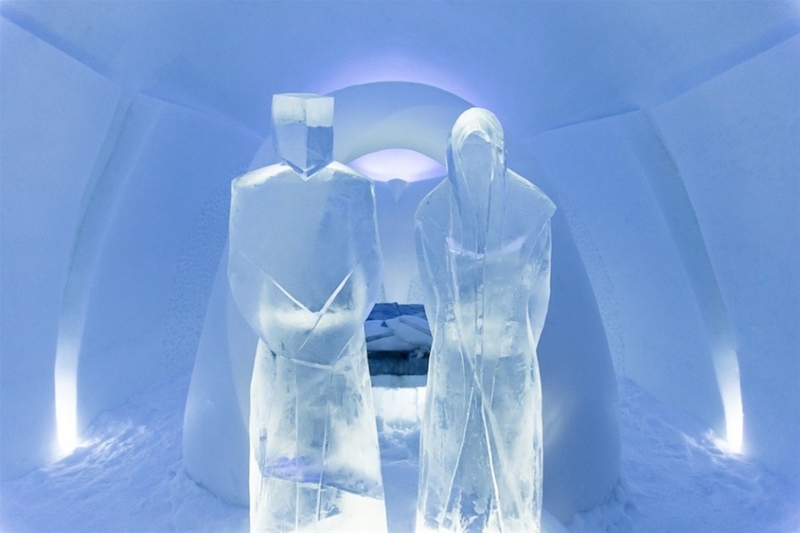 ICEHOTEL covers 5,500 square meters and is constructed from 1,000 tonnes of Torne River ice and 30,000 tons of “snice”, a mixture of snow and ice that strengthens the structure. 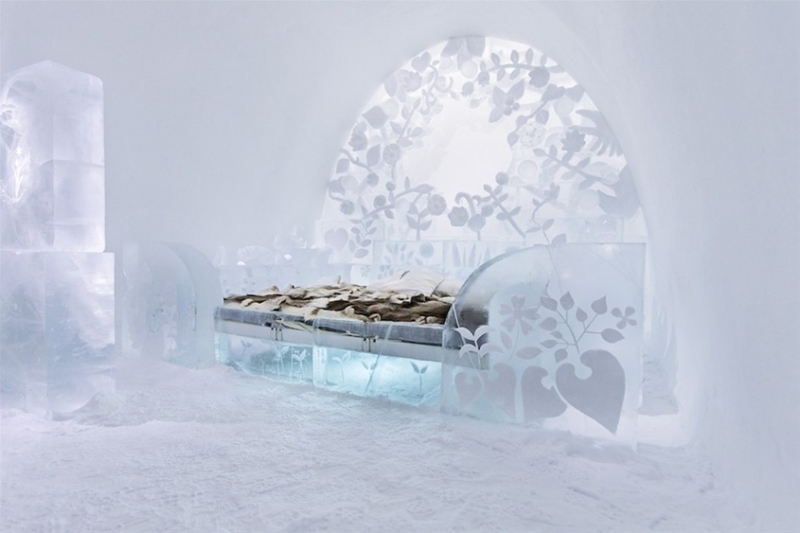 ICEHOTEL is beautiful and ephemeral, changing yet consistent. 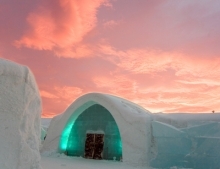 Food is served in one of three eateries: the ICEHOTEL restaurant is a fine gourmet restaurant, Hembygsgården is a traditional homestead restaurant in a building that used to be the village school and the Lounge is a cosy relaxing place to enjoy snacks and light bites. 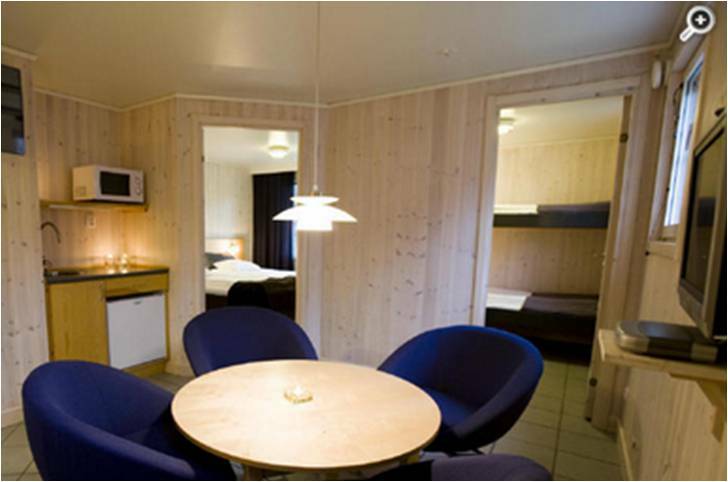 All stays include warm winter clothes, gloves, shoes, breakfast buffet, morning sauna and admission to ICEHOTEL. 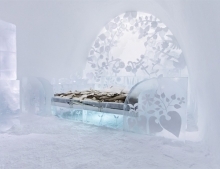 The world famous ice hotel offers 60 rooms that are built each year, ranging from Snow Rooms to Art Suites adorned with stunning ice sculptures and flushed with subtle lighting. 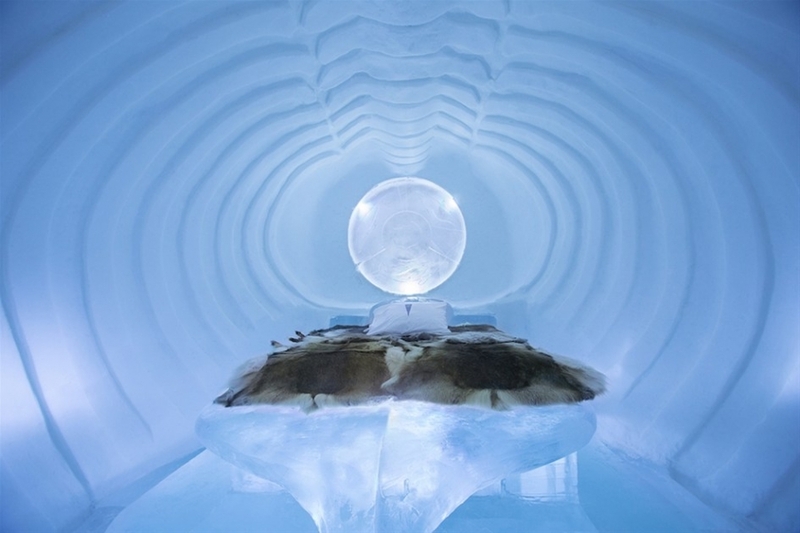 Through its reindeer-skin clad doors you'll find a breathtaking ice pillared hallway illuminated by dazzling ice sculptures and spectacular ice-carved chandelier. Don't miss the Icebar where colourful vodka cocktails are served in chunky ice glasses! 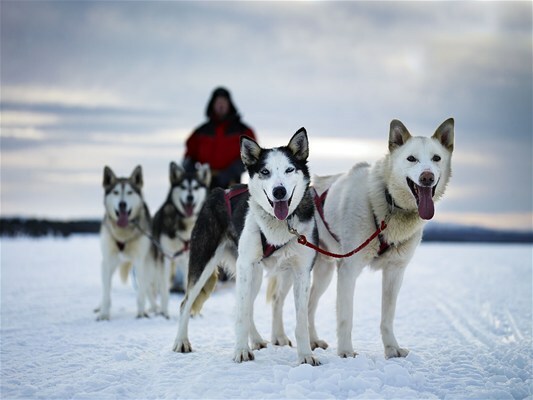 Today you can choose from our menu of winter activities including dog-sledding, horseback riding, snow mobiling and more. Or simply relax and enjoy the peaceful surroundings. Another free day to enjoy a wintry activity. We'll provide you with a full list of available excursions to book and tailor your break. 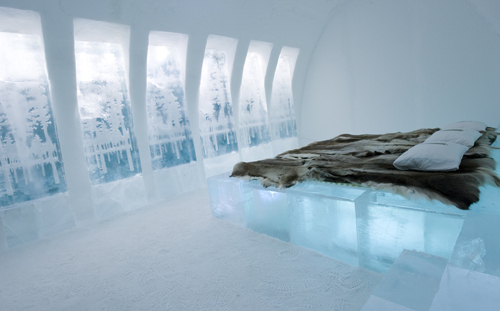 In the evening you’ll stay in a cold ice room of your choosing. 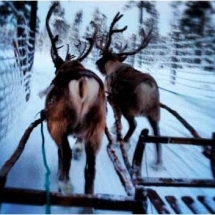 You’ll stay warm and cosy in a thick winter sleeping bag on top of reindeer hides. Transfer to the airport and return. 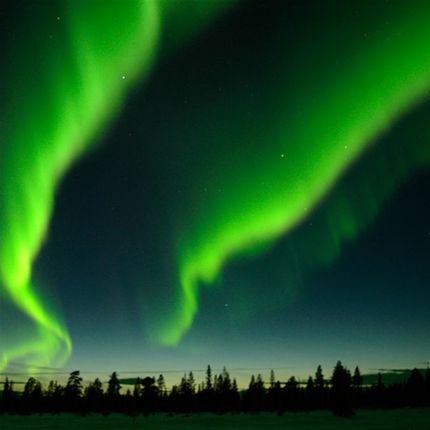 Or extend your stay in Sweden with extra nights. We’ll be happy to help you tailor your trip to your requirements. From £525 per person, excluding flights, based on departures 1-13 December 2018. Please get in touch with us for a detailed price quotation for your group, flight prices and to check availability for your preferred travel dates and choice of activities.